CIMMYT’s Earthquake Recovery Support Program (EQRSP) has directly impacted the lives of nearly 50,000 farmers in the earthquake-hit areas of Nepal in the last one year. Supported by the U.S. Agency for International Development (USAID) and implemented in cooperation with Nepal’s Ministry of Agricultural Development, the 13-month EQRSP was started in June 2015 through a US$ 1 million grant to CSISA in Nepal. The program has deployed a suite of agricultural assets including mini-tillers and other farm machines, seed and grain storage facilities, agricultural hand tools, technical training and agronomy support across eight of the most risk-prone affected districts. As nearly two-thirds of Nepal’s population relies on agriculture for their livelihood, the devastation caused by last year’s earthquake and subsequent aftershocks have undermined the affected region’s food security, with estimated losses of more than US$ 280 million in the agriculture sector alone. The quakes destroyed grain and seed stockpiles, killed and injured milch and draft animals, wrecked tools and implements and collapsed regional irrigation and agricultural markets’ infrastructure. While the program’s monitoring and evaluation activities are still underway, initial impacts can be estimated. The storage bags and cocoons distributed by EQRSP are expected to save about 2,700 tons of grain and seed; agricultural hand tools have facilitated important sustainable intensification practices; agronomy guides have provided information on new production technologies and management practices. The 400 mini-tillers distributed can cover 700 hectares of land, reducing drudgery for women especially. Consequently, mechanics trained by EQRSP are ensuring repair services for mini-tillers are available locally, which encourages continued demand for the machines. 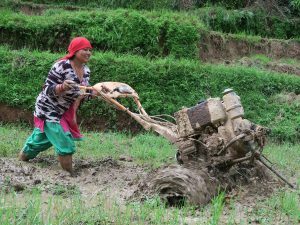 Subarna Bhandari, one of the recipients from Sindhupalchowk district, operated his mini-tiller for a total of 120 hours, earning a gross income of approximately US$ 540 within 3 months. The combined 8 machines that were distributed in his area would therefore help the recipients earn an aggregate US$ 4,320. As a resident from the same village states, “It was difficult to rent bullocks on time because everyone in the village had the same requirement at the same time throughout the village.” She would need three pairs of bullocks for two rounds of plowing at a cost of roughly US$ 60. Thanks to the mini-tiller, the same activity now only costs US$ 14. This article is authored by Dilli K.C., CIMMYT Monitoring and Evaluation Specialist.